The Lakes Park Community Garden harvests fresh produce twice monthly during the growing season. Several dedicated beds provide for fresh food donations, and Community Garden members contribute any excess food they have grown. 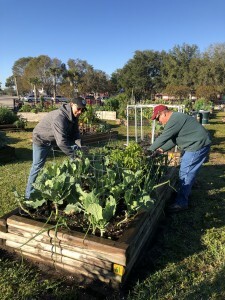 During these harvests, the Community Garden volunteers also collect canned and boxed food donations from fellow gardeners and friends of the park. The food is brought that same morning to the Community Cooperative soup kitchen on SR 82/Dr Martin Luther King Blvd in Fort Myers. Bill Johnson leads the volunteer donation and harvest team. 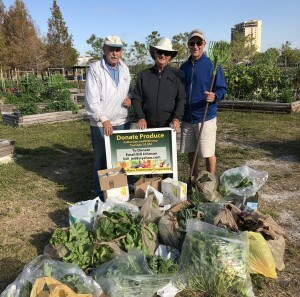 “We made our sixth donation for the 2019 growing season on Tuesday Jan. 29, 2019. We donated can goods, dried foods and a large variety of produce for a combined total of 160 lbs. This brings our total to 810 lbs. for the 2019 growing season. Special thanks to the “A” team members for helping with the harvesting on such a cold morning. (Dorothea McLaughlin, Jim Dubyak, Doc Johnson, Norm Smith & Jan Johnson). I would also like to thank the following garden beds for their kind donations (1, 8, 13, 15, 18, 38, 39, 40, 48, 56, 57, 59, 61, 65, 69, 74, Kathy Busick & the Children`s Garden Center). Here are some photos of today’s volunteers and the harvest. Well done, Community Garden! 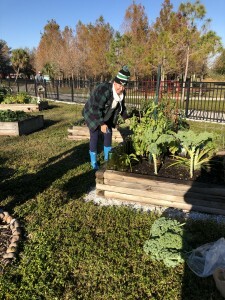 Lakes Park Community Garden volunteers harvest fresh produce for the Community Cooperative, January 29th, 2019. 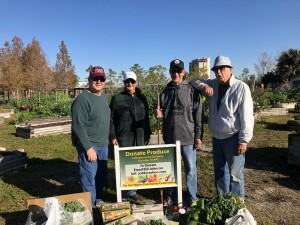 “We made our fifth food donation for the 2019 growing season on Tuesday Jan. 15, 2019. We donated canned goods and lots of different types of produce for a combined total of 172 lbs. This brings our total to 650 lbs. for the 2019 growing season. The Community Cooperative Cafe on Martin Luther King Blvd. really appreciates Lakes Parks Garden Community for our kind donations. Special thanks to Dorothea McLaughlin, Jim Dubyak & Doc Johnson for helping with the harvesting. What a team. I would also like to thank the following garden beds for their kind donations (5, 13, 15, 18, 40, 42, 48, 56, 57, 59, 61, 62, 64, 65, 73, 76, Kathy Busick & the Children`s Garden Center). I hope I didn’t miss anyone. INTERESTED IN DONATING FOOD? You can contribute unopened boxed and canned food on our collection days. INTERESTED IN VOLUNTEERING? Although each renter maintains their own bed, there are common areas in and around the Community Garden that need regular maintenance. Help is also needed on harvest days. INTERESTED IN RENTING A COMMUNITY GARDEN BED? Community Garden beds are in high demand, but we do occasionally get a vacancy. When that happens, we conduct a lottery to select the next person who can apply for the empty bed(s).